GATE 2016 is expected to take place on January 30 till February 7 next year. IISC, Bangalore conducts the exam to provide admission to students in Master of Engineering degree programs. The score obtained in GATE 2016 will be valid for a period of three years only from the date of announcement of results. From September 1, the online registration for GATE will commence & the last date for online filling of forms is October 1. 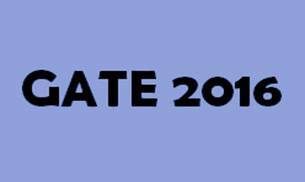 The syllabi for GATE 2016 papers have been revised and differs from those of GATE 2015. Earlier there were total 22 papers, but now after the introduction of a new stream namely, Petroleum Engineering (PE) the total number of papers is 23. The duration of the examination will be 3 hours. There will be 65 questions and maximum marks will be 100. The examination will be an online computer based test (CBT), which will contain multiple choice questions (MCQ). One change that has been introduced this year is that now an online virtual calculator will be provided to all examinees during the examination, whereas earlier students used to get their own calculators. Linear Algebra: Matrices and determinants, Systems of linear equations, Eigen values and Eigen vectors. Calculus: Limit, continuity and differentiability, Partial derivatives, Maxima and minima, Sequences and series, Test for convergence, Fourier Series. Differential Equations: Linear and nonlinear first order ODEs, higher order ODEs with constant coefficients, Cauchy's and Euler's equations, Laplace transforms, PDE-Laplace, heat and wave equations. Probability and Statistics: Mean, median, mode and standard deviation, Random variables, Poisson, normal and binomial distributions, Correlation and regression analysis. Numerical Methods: Solution of linear and nonlinear algebraic equations, Integration of trapezoidal and Simpson's rule, Single and multistep methods for differential equations. New topics: Biological membranes, structure, action potential, Enzymesclassification, kinetics and mechanism of action; Basic concepts and designs of metabolism (carbohydrates, lipids, amino acids and nucleic acids) photosynthesis, respiration and electron transport chain. Topics removed: Ramachandran map; Weak inter-molecular interactions in biomacromolecules; Kinetics of single substrate and bi-substrate enzyme catalyzed reactions; membrane pumps; Cell cycle and cell growth control; Cell signaling and signal transduction; Biochemical and biophysical techniques for macromolecular analysis.Metabolism (Glycolysis, TCA and Oxidative. New topics: Viruses- structure and classification; Microbial classification and diversity (bacterial, algal and fungal); Methods in microbiology; Microbial diseases and host-pathogen interaction. Topics removed : Prokaryotic and eukaryotic cell structure; Chemical basis of mutations and mutagens; Microbial genetics (plasmids, transformation, transduction, conjugation); Microbial diversity and characteristic features. Cell Biology: Prokaryotic and eukaryotic cell structure; Cell cycle and cell growth control; Cell-Cell communication, Cell signaling and signal transduction. Molecular Biology and Genetics: Molecular structure of genes and chromosomes; Nucleic acid replication, transcription, translation and their regulatory mechanisms in prokaryotes and eukaryotes; Mendelian inheritance; Gene interaction; Complementation; Linkage, recombination, and chromosome mapping; Extra chromosomal inheritance; Chromosomal variation; Molecular basis of genetic diseases. New topics: Mutations and mutagenesis; Microbial genetics (plasmids, transformation, transduction, conjugation) (previously this topic was in microbiology); Horizontal gene transfer; RNA interference; DNA damage and repair. Analytical Techniques: Principles of microscopy-light, electron, fluorescent and confocal; Centrifugation- high speed and ultra; Principles of spectroscopy-UV, visible, CD, IR, FTIR, Raman, MS,NMR; Principles of chromatography- ion exchange, gel filtration, hydrophobic interaction, affinity, GC,HPLC, FPLC; Electrophoresis; Microarray. Immunology: History of Immunology; Antigen; Synthesis of antibody and secretion; Antigen-antibody reaction; Complement; Primary and secondary lymphoid organ; B and T cells and macrophages; Major histocompatibility complex (MHC); Antigen processing and presentation; Polyclonal and monoclonal antibody; Regulation of immune response; Immune tolerance; Hypersensitivity; Autoimmunity; Graft versus host reaction. Bioinformatics: Major bioinformatic resources and search tools; Sequence and structure databases; Sequence analysis (biomolecular sequence file formats, scoring matrices, sequence alignment, phylogeny); Molecular dynamics and simulations (basic concepts including force fields). Topics removed: Genomics and Proteomics (Large scale genome sequencing strategies; Comparative genomics; Understanding DNA microarrays and protein arrays). rnlabeling; DNA sequencing; Polymerase chain reactions; DNA fingerprinting; Southern and northern blotting; In-situ hybridization; RAPD, RFLP; Site-directed mutagenesis; Gene transfer technologies; Gene therapy. Totipotency; Regeneration of plants; Plant growth regulators and elicitors; Tissue culture and Cell suspension culture system: methodology, kinetics of growth and, nutrient optimization; Production of secondary metabolites by plant suspension cultures; Hairy root culture; transgenic plants; Plant products of industrial importance. New topics: Tissue culture; Animal cell culture; media composition and growth conditions; Animal cell and tissue preservation; Anchorage and non-anchorage dependent cell culture; Kinetics of cell growth; Micro & macro-carrier culture; Hybridoma technology; Stem cell technology; Animal cloning; Transgenic animals. Topics removed: Special features and organization of plant cells; Biochemistry of major metabolic pathways and products; Autotrophic and heterotrophic growth; production formation. Rheology of fermentation fluids, Aeration and agitation; Kinetics of microbial growth, substrate utilization and product formation; Sterilization of air and media; Batch, fed-batch and continuous processes; Various types of microbial and enzyme reactors; Instrumentation control and optimization; Production of biomass and primary/secondary metabolites; Large scale production and purification of recombinant proteins; Industrial application of chromatographic and membrane based bio separation methods; Immobilization of biocatalysts (enzymes and cells) for bio conversion processes; Bioremediation-Aerobic and anaerobic processes for stabilization of solid / liquid wastes. New topics: Chemical engineering principles applied to the biological system, Principle of reactor design, ideal and non-ideal multiphase bioreactors; heat transfer; Media formulation and optimization; Unit operations in solid-liquid separation and liquid-liquid extraction; Process scale-up, economics, and feasibility analysis. Engineering principle of bioprocessing- Upstream production and downstream; Bioprocess design and development from lab to industrial scale; Microbial, animal and plant cell culture platforms; Biofuels, Bioplastics, industrial enzymes.